Our family has had some unusual pets over the years, including a chameleon, a gecko, and a bearded dragon lizard. 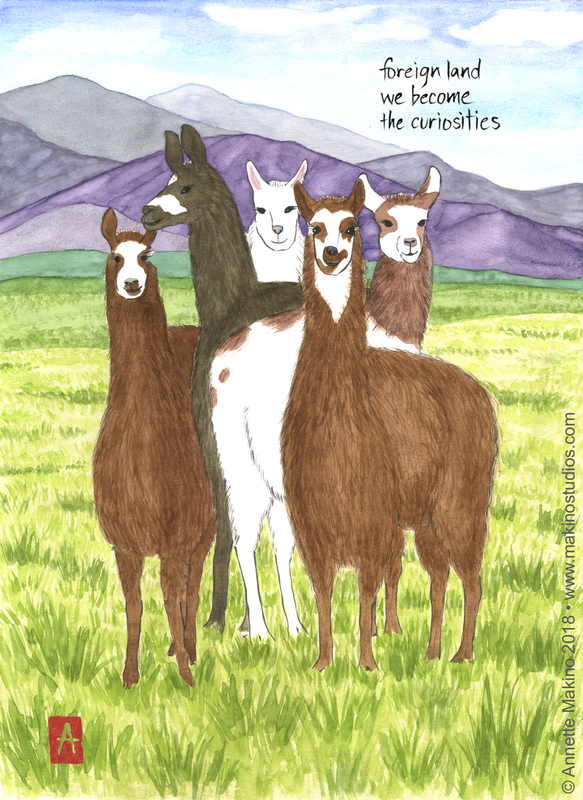 But the oddest animals by far were our llamas. As my mother approached her 70s, she still loved to hike and camp, but could no longer comfortably carry a heavy backpack. So she did the logical thing: bought two llamas and trained them to carry packs. Having lived in Peru for a couple of years in her 30s, she was more familiar with llamas than most of us are. 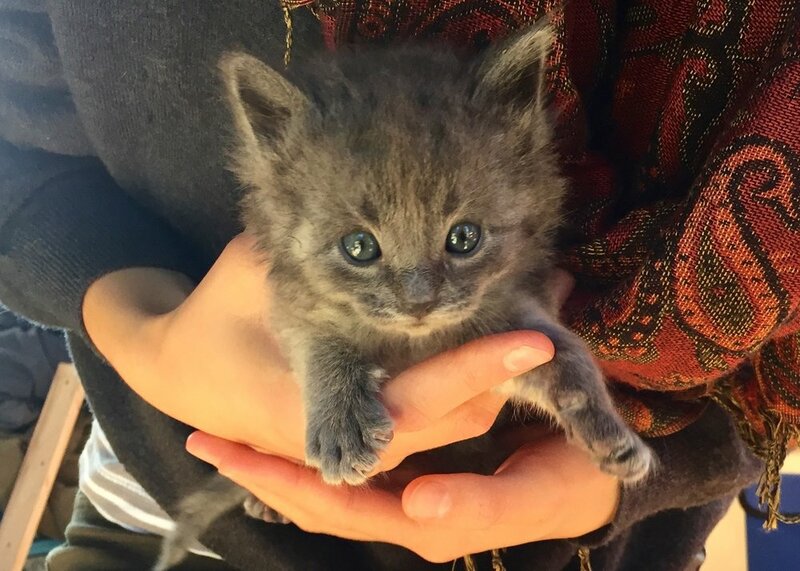 Soon after, she moved in with us to help take care of our young kids. And so it came to pass that two handsome male llamas, Shandy and Dancer, took up residence on our grounds. Though they might flatten their ears back and spit green saliva when aggravated, these long-lashed creatures were unfailingly attentive and protective towards our toddlers. I will always remember the time our very verbal daughter, sitting in her high chair, looked out at the llama pen and squeaked, “Dose llamas are looking at us dubiously.” I’m pretty sure that was the first time in human history that sentence was uttered from a high chair! Once trained, Shandy and Dancer could each carry up to 80 pounds in their saddle packs. The easiest backpacking trip I’ve ever done was the one with our then-three-year old daughter in Northern California’s Trinity Alps, where we just wore day packs and pushed a baby stroller while the llamas carried all the gear and food. But it was not all fun and games. Yes, there was some drama with our llamas. One day, Dancer got loose and ate a large part of a rhododendron bush, which is toxic to llamas. He started foaming at the mouth and we had to make an emergency trip to the vet. My husband and the vet stood together in the back of the pickup, trying to pump mineral oil down Dancer’s throat through a plastic tube. The poor llama twisted and swung his powerful neck, then spewed the contents of his stomach all over his rescuers. Thankfully, he survived! In 2007, we moved away for a year and my mother decided to spend some months traveling as well. So after almost ten years with “the boys,” my mother gave her llamas away to some folks with a nice pasture. But they live on in the fertility of our garden, and in our memories. Whether they involve llamas, lizards or other critters, I would love to hear about your animal dramas! At four, my son leads our llama Shandy down the road. Free shipping this week: Get free shipping on 6 or more greeting cards through this Sunday, Sept. 30! Use code CARDFREESHIP. 9/28/18 UPDATE: PARTICIPATION CANCELED DUE TO RAIN FORECAST. Fieldbrook Art & Wine Festival: Makino Studios will have a booth at this lovely event at the Fieldbrook Winery in Fieldbrook, California this Saturday, Sept. 29, 11 a.m. to 4 p.m.
New cards: I’m excited to share with you a dozen new and updated card designs! There are birthday, holiday, sympathy, thank you and everyday cards. And you can also see my new art prints. 2019 calendar: My 2019 mini-calendar of art and haiku is off the press! 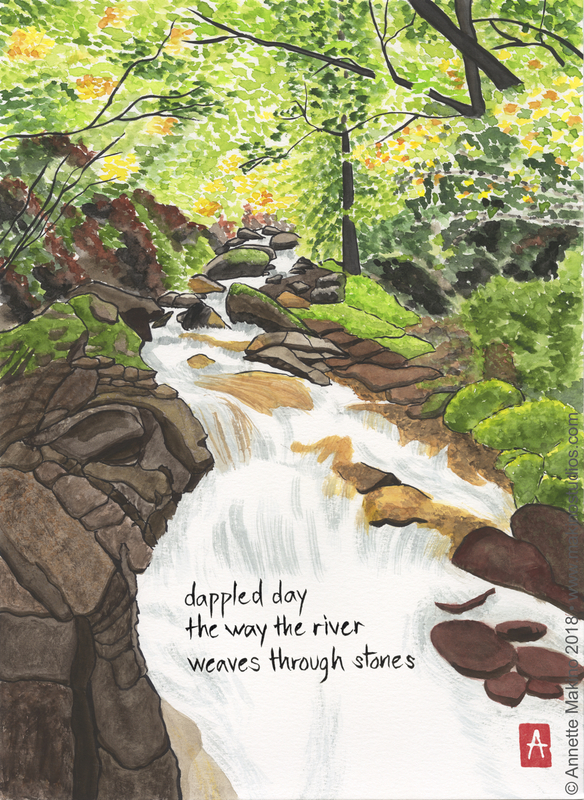 The calendar includes twelve original paintings, an artist’s bio and some background on haiku and haiga (haiku art). Custom Paintings: You can order a custom piece to honor a life passage like a birthday, wedding, or birth. I will talk with you to understand what is unique about this person in your life, and then create an original painting, with or without a haiku. Sizes and prices are variable. Connecting: I always love hearing from readers. We can also stay connected via my annettemakino Instagram feed, Makino Studios Facebook page and @Ant99 account on Twitter. “lines of foam” is 11×14, painted with sumi ink and Japanese watercolors on paper. It is available as a signed print or a greeting card reading, “wishing you a sparkling birthday”. © Annette Makino 2015. The haiku "lines of foam" was first published in Frogpond 35:3 (Winter 2012). Although I grew up along the California coast and walk on the beach several times a week, I, too, am amazed by the Pacific. It is not only unfathomably vast, but always changing with the time of day, weather, tide, and season. One day it can be a wash of gray from sea to sky, with barely a discernible horizon. Another day it can be so sparkling clear that even the wet sand shines blue. In this time of dismaying headlines and extreme political dysfunction, I find the ocean especially restorative. My lungs fill with negative ions and the sea breeze blows away my cares. Spending time here helps me to put our ridiculous human problems in perspective and to regain a sense of geological time. My dog Misha delights in running on the beach. The beach is also where I find ideas and inspiration for my art and haiku, sometimes sitting on a driftwood log listening to the waves. The ocean where life began is an endless source of creativity. If you are fortunate enough to live near the beach, I hope you will grab a hat and get out there. Happy summer! August Vacation: I will be on a painting vacation on the Klamath River the week of Aug. 4-11. Any orders that come in that week will ship on Monday, Aug. 13. North Country Fair: Mark your calendar for the North Country Fair in Arcata, CA the weekend of Sept. 15-16! This festive event features 170 booths, live entertainment on three stages, and two parades. I’ll have my newest cards and 2019 calendars at the Makino Studios booth on G Street near 9th. Raffle Winner: Congratulations to Pat Bitton, who won $50 in Makino Studios store credit at the North Coast Open Studios raffle last month! For a chance to win, look for the raffle jar at my booth at the North Country Fair. Cards: Check out the Cards section of the Makino Studios site to find greeting cards for weddings, birthdays and more. And I’m working on several juicy new card designs this fall!